I’m ridiculously excited as the first in my ‘Knitting Genealogist’ series is out in the current issue of ‘Yarn Forward’ magazine. (Yarn Forward 29). In it, we featured this undated photo by Lewis Harding which, using my basic sleuthing powers, I was able to date to the early 1870s. I won’t say much about it here – but just to whet your appetite, I will say something that never made it into the article. The photo is of Mary Jane Langmaid and Ann Elizabeth Jolliff.It was taken at Harding’s studio at his home, Osprey Cottage, in Polperro. Both were Polperro girls. Lewis Harding was one of those middle class, slightly jobless types who had grown up in London, Cornwall and France. In middle age, his doctor thought taking up photography might be therapeutic. This photo was taken with the collodion process, so fairly cutting edge for the date. But we have earlier photos of locals – fishermen, on the whole, including the famous panel of 84 portraits, thought to be taken in the 1850s/60s. These are the first, clear images of ganseys ever taken. Now, in theory….these girls could be two random locals, posed with someone else’s knitting. The collodion process required them to sit still for 30 seconds or slightly longer, meaning what we’re looking at here is Girls Holding Their Knitting, as opposed to Girls Knitting. The girls are not using knitting sheaths, as you’d expect professional hand knitters to do so, at this date. Or not obviously. However, I managed to use Censuses to establish that Mary Jane and Ann were in fact contract knitters from an early age and both went on to knit for a living. If you’re remotely interested, buy the magazine and read more about Mary Jane and Ann. It’s so rare we can have such a good quality image, from so early on AND be able to put a name to the subjects. I have a more lengthy article in a forthcoming ‘Family Tree Magazine’ about tracing your knitting ancestors. It’s amazing just how many hand knitters there were in 19thC England. I have been silent but not entirely lazy. Not just writing but doing book research. One of the areas I’ve been looking at are the York charity schools. I was really lucky enough to be able to hold a 1799 book by Catharine Cappe, founder of the York Knitting and Spinning Schools, in my hand and take notes directly from it. Catharine described precisely how the schools were run, when she set them up in the early 1780s. Again, not a spoiler but a morsel…. Catharine was so successful with her charity school ventures that the already existing York Grey Coat Girls’ School asked her to intervene to rescue their failing venture. In 1780, Catharine had visited York, only to hear that whilst the boys’ school (Blue Coat) was fine, the girls’ School turned out girls who were “sickly, remarkably low of stature, and unfavourable….”  The school’s doctor remarked to Catharine that there were, to his knowledge, “…nine miserable girls… upon the town,, the wretched victims of prostitution…”  Catharine decided to investigate. Girls had to knit a stocking in a week by the age of around 7, to be even accepted into the main school. This gives us a sense of their speed and ability. She managed to turn the place round and make the girls into knitters and spinners as opposed to Ladies of Negotiable Affections. As hand spinning died out, the same class of women were encouraged to take up knitting. There were some things frame-knitting (machine knitting) couldn’t do – or couldn’t do well. 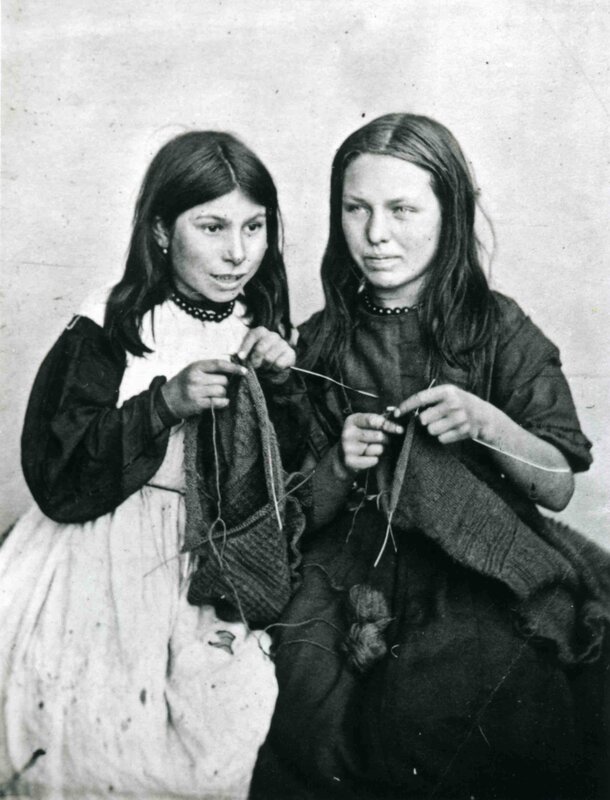 By the late 19thC, a girl who was a competent fancy knitter could earn more staying at home and knitting, than if she went out to be a servant – so it was an attractive option.